Long lining is art of using a long line suspend from the cargo hook of the helicopter to fly external loads from one location to another. Helicopters sling wild animals, TV antennas, air conditioners, logs and just about anything else you think of. They do this because there is not a crane around or in some cases it is cheaper then a crane. The BLM and USFS do it because they need something delivered to a side of a steep hill in the middle of a wilderness. Among other things, I commonly long line food, water and sleeping bags into the crews on the fire line, they are glad I can. Back when the OAS gave me a check ride I was required to hover my external load, which was on the end of a 100 foot line, a few feet over a ten foot circle for 30 seconds. That was easy compared to real life. Rogers helicopters also gave me a Part 133 ground school and check ride, we’re pretty regulated. The Rogers check ride was chance for the Chief Pilot to yell at me for being to smooth on the controls, a first for me. You see, flying long lines is like nothing else I do, I must make the helicopter fly the load, and that means jerking the helicopter around sometimes. When the external load starts to swing to the right, I must move the helicopter to the right, immediately! If I don’t “catch” the load I could end up “punching it off” (releasing the load). Which not only makes things exciting for the folks on the ground, but expensive if I’m flying a 15,000.00 radio repeater to the top of a peak. 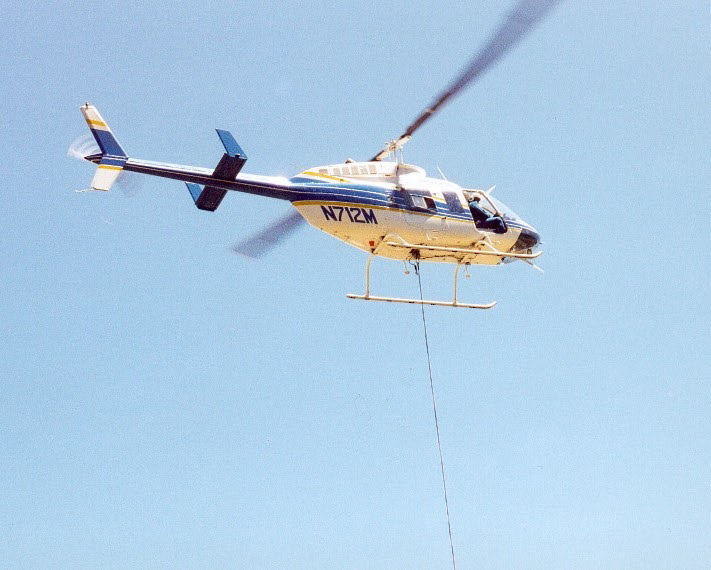 When you show up on a fire contract, often the first thing the helitac people want to see is if you can long line. There have been problems with pilots not being up to the standards required. I’m told by the crews that I’m good with the long line but that doesn’t mean they’re not paying close attention when I’m swinging the 37 pound remote hook around their ears. There are probably less than 300 hundred pilots in the USA that have been government approved to do long line in any given year. We use the remote hook so I can drop one cargo net and pick up another while hovering over the same drop zone. Under emergency conditions I can drop the entire load at the cargo hook on the helicopter, but the preferred way is to release the remote hook at the end of the long line near the cargo net. As I neared the fire I could see we had an inversion going, with no wind and warmer temperatures at altitude the only thing you could see was the very tops of the mountains. The top of the peak I was flying to was covered with dense smoke except for the last 20 or 30 feet. Just the drop zone was poking its head above the smoke. A small island in the sky. Another name for long line or external loads is vertical reference work. That day I didn’t have much vertical reference to work with, the smoke was making it almost impossible for me to lean out of the helicopter and fly the load to the DZ. I made two attempts, getting vertigo so bad I wanted to throw up my breakfast. On the third attempt I had the ground crews talk me down with vertical and horizontal information over the radio, while I looked out at the horizon to keep control of the helicopter. So my job long lining the smoke jumper gear was a typical job, except by now you know there are no typical jobs flying a helicopter on wild land fires. The small clearing had mature 100 foot pine trees surrounding it. Forget police officers, where are the LOGGERS when you really need them? Perish the thought, but “Me thinkest the smoke jumpers hast lied,” when they said they only had 650 pounds in the cargo net. As I pulled the load up to a 50 foot hover I glanced back into the helicopter to see I had pulled 100% torque, not to worry, I can pull 104% for a very short time. I don’t often have to do that, as I consider anything over 90% as my personal safety buffer zone. As I started the helicopter flying forward I could see a 125 foot snag, off my nose, glaring at me. Like the Chicken relative to the egg, being only involved and the Pig relative to the bacon, I’m fully committed by the time I realize I aint going to clear that snag with the cargo net. I have two options, I can drop the external load, like, how much is it going to hurt a bunch of parachutes to drop 75 feet? My second option is to put two pounds of pressure on the four pound release switch and swing the load around the snag. I swing the helicopter to the right, with cyclic and a tad of right pedal. Just like I knew what I was doing the cargo net swings out to the left and around the snag. My load clears the rest of the trees with room to spare.